Hi spring!! You bring so much new life! Literally and figuratively. I could really feel spring this week, anyone else? It's like this weight of winter kind of lifts away. I love how the way we eat, gather and spend our time changes in the spring. And any season for that matter. Just the pep I needed in my step after feeling pretty stagnant lately. -An archived post refurbished! Loved this update version of "What's In My Bag" that I posted last week! -New Garden Salad coming to the spring menu at The Jones. 2 words. Biscuit. Croutons. -Clean out the fridge meal number 1 of the week. Shaved brussels sprouts with lemony hummus dressing, jalapeños and toasted pine nuts. -Clean out the fridge meal number2, and my favorite go-to clean out the fridge meal = shakshuka. This Italian version was bon appetitio! Just marinara sauce, 2 eggs, torn basil and some pesto! -Bribing my church community group with perfect CCCs in case they didn't like the meal I made during our cooking class (more on that later this week). -Have y'all tried Lesser Evil Snacks? LOVE their healthy popcorn. Use the code SpringLE to get 10% off. Locally can be bought at Whole Foods and Natural Grocers. -WWE or Kathleen, Chloe and Annie walk into a boxing gym??? -Sunday morning brekkie! With my favorite soft boiled egg cups that make me feel fancy! At work this summer I did a blog series called "Bag in a Bag in a Bag." It was one of my favorite posts, getting to show off SCOUT bags and the different kinds of products you would carry in each bag. Today I'm doing my own version of the bag in a bag post! I carry a big ole periwinkle bag that is slightly obnoxious, but I love it. 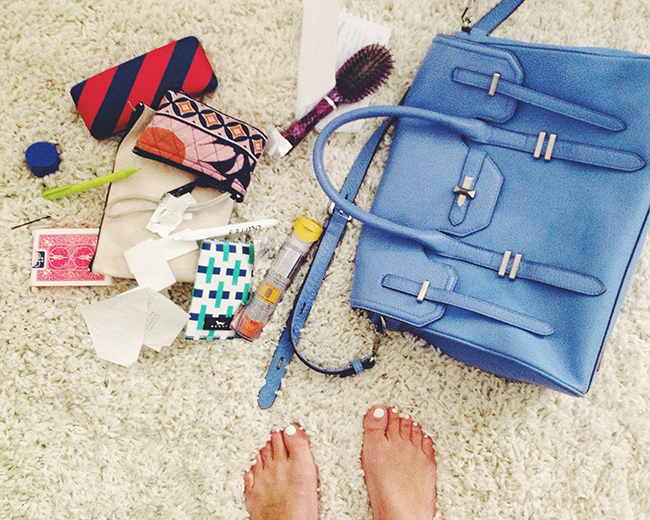 Inside I keep very simple essentials like sunglasses, gum, a makeup bag and car keys. My purse is the Rebecca Minkoff Jules Satchel and my wallet is SCOUT's Cash-N-Carry, it's seriously the best wallet to switch from big purse to little purse, every girl needs one. I got my "I Live To Eat" makeup bag in NYC at Chelsea Market, but found the girl and all of her funny saying canvas bags on Etsy! Inside I keep Revlon's lip stain, Chapstick original and a sample of Bond No. 9 Hudson Yards perfume. My sunglasses are cheap polarized aviators (similar style below) and my camera is a Sony cybershot. The version I have is discontinued but I have a similar one listed below. I recommend it to everyone. My other essentials are Extra spearmint gum, a purse size brush and a huge tassel key chain so I can keep track of my keys in my big bag! Now for what my purse really looks like when I dump it out. Gum wrappers, bobby pins, my Epi-Pen and a mess of other random things.